Communication - What would Dennis Do? 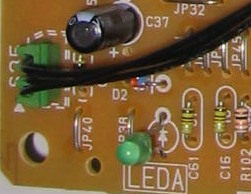 Green (typical) monitor leds on pcbs do not blink to indicate power status. This has always been the assumption. They do this not because the pcb has a power supply , but rather the CPU is telling it to do so. The CPU status is what it is telling you, this is why they sometimes term them "health" monitor. Standby power regulations and energy conservation logic controls. improve system power losses. Reactive power; losses from inefficient electrical consumption by inductance in the coils and chokes during off mode have been addressed by manufacturers. Monitor leds may shut off now for two reasons. 1 - redundancy program control, where if a system is not in active use, they close down certain components , but the unit is in a "listen" mode to the next command and will wake up the system. This is done to power-down non essential pcb circuits and cut out reactive power losses. For those of you who do not know what reactive power is, It is part of the total power consumption of an appliance but produces no real work. You may know it better as power factor which is percentage of real power (useful power) and reactive power (non useful) from the total apparent power supplied to the appliance. The split air conditioner has a fault where there is no communication between indoor and outdoor unit. If your lucky the indoor or outdoor pcb will be the fault or the interconnecting wiring will be broken. Well these days that fault has a few more reasons which in many cases are not the issue of the air conditioner. To explain , the units communicate by analogue to digital conversion via a voltage through the communication cable. Some brands start the process off by the outdoor unit making first contact. Every unit has a reference oscillation circuit (timing circuit) of a repeating waveform that forms the basis of the language. Think of it as a clock. Both indoor and outdoor can understand this. When a command is sent by remote control , the waveform is modified by one unit. sent to the other unit which compares the waveform to original forming a value of the difference in doing so. This could be temp up/down etc. That value becomes the digital signal. At least that's what I know about it. Most people know that if the communication wiring is induced by other voltages from current carrying cables in the vicinity , this will cause a breakdown of the timing circuit frequency and it gets rubbish at the other end it cannot reference. Some will use shielded cable in this instance. It can also occur for other reasons , Im stating what I have seen , not that this is all fact absolute or occurs every time due to OK? 1 - The polarity of the mains wiring is reversed indoor or outdoor, even if the communication wire is in the right place. 2 - Transmission/receive circuit failure indoor or outdoor. If the outdoor unit begins transmission and the indoor can receive it , all good. If the transmission circuit on the indoor fails, or the receive circuit on the outdoor fails in that arrangement , it will never fault but never work either. This fault is rare and annoying to find, typically an event from high power damage such as storms. PCBS have to be changed but your never sure which one the monitor leds blink indoor and outdoor. 3 - Inverter DC malfunctions from faulty fan motors can stall the outdoor communication system. Monitor led failure may return on removal of the fan motor from circuit. 4 - Incompatible indoor and outdoor that use different oscillation frequency's, if from the same manufacturer they will usually generate a code to tell you that. Sleep mode.... on Split AC Units. Well, how much is 5 or 10 Watts in terms of power consumption? Capacitors and inductors on pcbs have the habit of causing reactive power losses. This is where power is consumed from the total energy supplied to the unit but some is lost without producing any real work. Real power is the actual energy you can measure , eg with an amp meter. Now this problem is a real issue on standby mode, where the unit is not being used and active power is being consumed by the logic system / memory / processor and its need to be supplied constant energy in a monitoring mode. Flashing LED's for instance to tell us that all is ok can actually tell us all is not ok - reactively speaking. So enter sleep mode where redundancy is engaged after a period of time to shut off non essential systems and we notice that monitor leds stop blinking. These system re-fire on signal from the next command priority generated by remote or an autonomous input from a sensor that creates a system wake command to start a function, eg outdoor pcb cooling mode in hot weather. Its a good idea and makes the product more energy efficient. Problem is that some AC manufacturers also stop the led blinking for communication disruptions , eg when a communication wire has been removed or a signal between indoor an outdoor is lost. 3 - Re-check the monitor LED's for either 1 or 2 and see if you have any life. **Then action diagnostics for malfunctions checks if no led blinks. Note: Monitor leds marked , as status , eg HAP , monitor or even with a love heart symbol only blink to tell you that the processor is functioning correctly and not that power supplies are good. Typically they blink at 0.5 second intervals, rapid flashing monitor leds can indicate a system malfunction. These flash intervals are not usually indicated in service manuals but from my experience , any led that blinks at different speeds from the normal you have always seen on any pcb indicate a problem exists.